As much as I tend to complain about S.M. Stirling and his fascination with nature - I do enjoy his stories and try not to let myself get bogged down by his writing. I was very surprised by how well his Island in the Sea of Time series was, so I knew he could write well. Last year I read his Dies the Fire series (reviewed here). The basic premise was that a ‘Change’ of some sort occurs that makes all technology from gunpowder on stop working. As most of the world dies off due to food shortages, a few bands of people group together to try to survive. The series was decent enough (again, ignoring his fascination with spending paragraphs on trees and grass) but not great. The Island in the Sea of Time series is loosely linked up to the Dies the Fire series. In the Island in the Sea of Time, the island of Nantucket is sent back a few thousand years. The world they leave behind is the world of Dies the Fire. 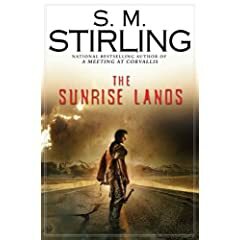 Stirling has now started a new trilogy with The Sunrise Lands. This book takes place a generation after Dies the Fire, and focuses more on the children of the main characters from the earlier series. Even more interesting, it begins to tie together the world of the Change and Nantucket. Without giving away too much - we get a glimpse of Nantucket and a small idea of what may have really happened, but what I really liked about the book was how well it was written. The action was non-stop, and we finally get a look at what is going on in the rest of America post-Change. I was really reminded of the ISOT series in how well the book read. I can definitely recommend picking up the book - although you probably should read the original trilogy first.